If you look around your house right now, does it look like the holidays exploded all over the place? 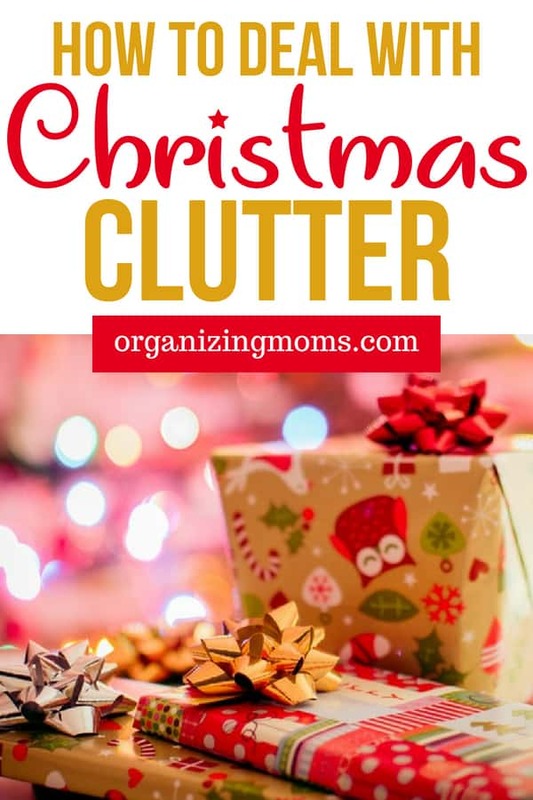 Are there boxes, wrapping paper, and packaging thrown all about? Are you wondering how you’ll ever get back to normal? The after-holiday mess can be overwhelming. There are all sorts of new goodies in your home, and it’s hard to know where to start in the clean-up process. Here are some ideas to help get you started. Start with the garbage. Get a big trash bag, and walk through your house looking for things to throw away. Just getting rid of gift wrap and leftover sweets you don’t want to be tempted to eat can make a big dent in the mess. Get rid of the boxes. We have a TON of boxes after Christmas. Not just boxes for presents, but the packages presents were delivered in. Plus food boxes. They’re everywhere! Get those boxes, break them down, and pile them in a centralized location to be disposed of. We have to take ours to the recycling center, but maybe your trash collectors will pick them up at your home. Do a huge clean out of your kitchen. Be ruthless. Get rid of the food that you’re not going to eat. Sweep the floor, clean out the fridge, and wipe down your countertops. Afterwards, treat yourself by going to the store and stocking up on healthy eats. Find a place for your new items. This will help you decide whether or not you have room for some of your new possessions. Be mindful of where you put gift cards. If you have gift cards for Amazon, add them to your account right now so you don’t have to worry about finding the gift code later. Be thankful. If they’re not already consolidated, put all of your gifts together and start writing thank you notes to the people who gave them to you. I like to do this while listening to podcasts. Come up with a plan for getting rid of gifts you won’t use or enjoy. You could return them to the store, regift them, donate them, or add them to your spring yard sale box. Collect the things you’d like to return. Make sure you have the receipt for each item. Then, put all of your return items together in a bag, and put them in your car. The next time you’re out, you can do some returning. Try to finish your returns as soon as possible for the maximum refund amount. Make a donation bag. This could be filled with gifts, holiday decor, or even clothes you’ve discovered you don’t need anymore. Put all of these items together in a bag/bags, and put them in your car. Next time you are out, you can drop them off at your local charity. Find a place to store items to re-gift. Use a container like a box or tub so that your space is limited. If your container is too full, it’s time to get rid of some re-gifting items. I like to put a post-it note with the name of the person who gave me each item on it. That way I won’t re-gift an item to the original giver. If you are so inclined, and super-organized, start adding things to your garage sale box for next spring. It’s best to put a price on each item as you put it in your garage sale box. That will save you a ton of time when garage sale season comes around. 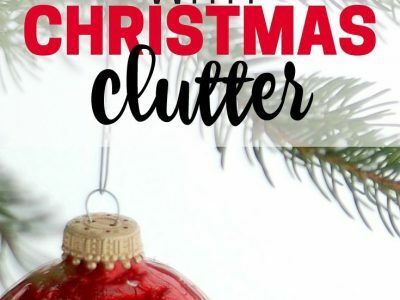 Put away Christmas decorations 30-minutes at a time. Some people like to do it all at once. If that’s you, that’s great. For me, that’s just too overwhelming, and I end up stressing and binging on Christmas candy. I put away Christmas decorations 30 minutes at a time, and I spread it out over a week or so. Getting someone in your family to help is wonderful, and makes things go so much more quickly. As you put away decorations, ask yourself if you really like them. Would you like to use them again next year, or would you be better off donating them? 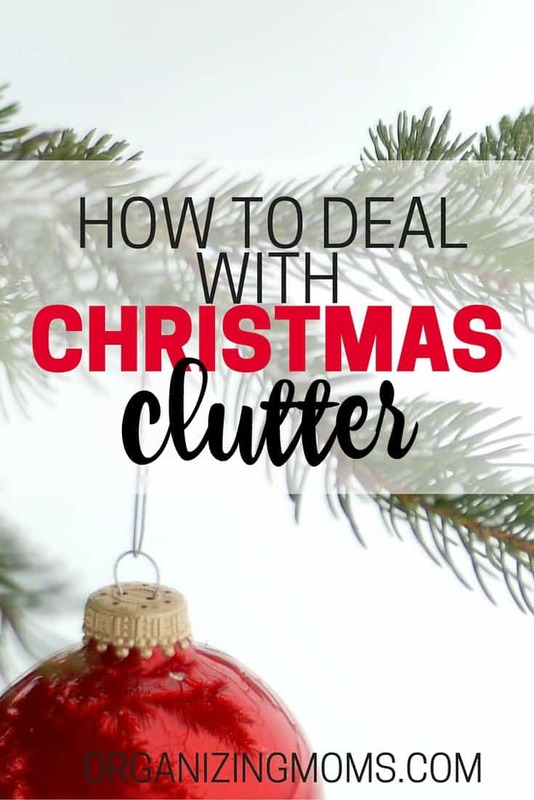 This is especially helpful to do with the decorations you didn’t put out this year. Maybe it’s time to let them go. Get Christmas decoration boxes into storage ASAP. Once they’re packed up, put them away. Remember. Go through your photos of this Christmas and remember the holiday. Send photos to your friends and family. Make prints if that’s something you do. Enjoy the memories! Plan for the new year. Do you want to get organized this year? Make a list of things you’d like to organize in 2019! 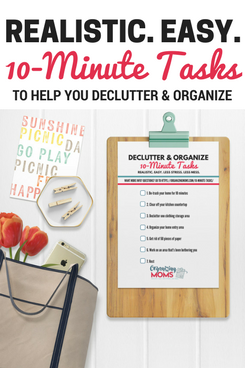 Looking for a way to declutter your home without the overwhelm? Get Rid of It! 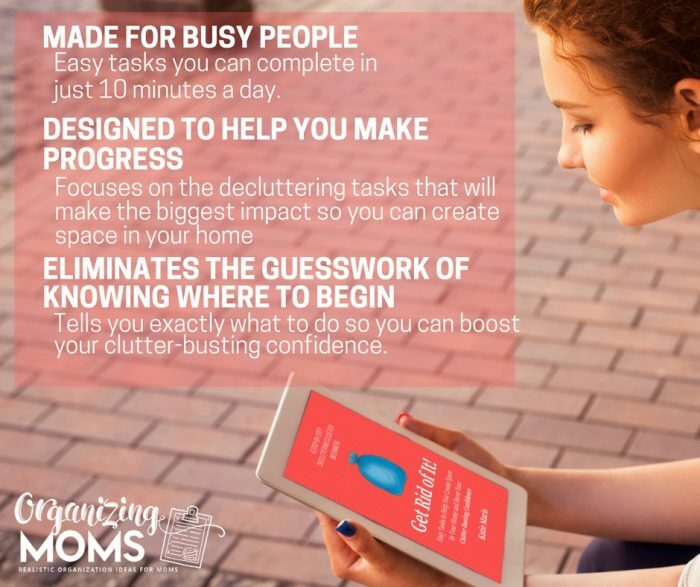 A Step-By-Step Guide to Decluttering for Beginners can get you started with a series of 30 easy, 10-minute decluttering tasks that are designed to help you see progress in your home. 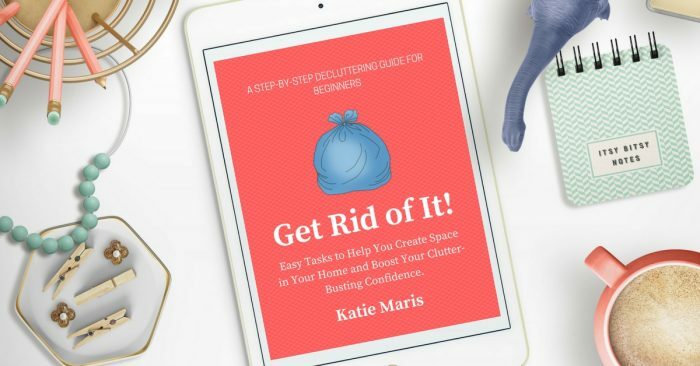 You’ll teach yourself to declutter efficiently and build your clutter-busting confidence. Click here to get your copy of the ebook.